For the control of ROUNDWORMS (Toxocara cati, Toxascaris leonina), HOOKWORMS (Ancylostoma tubaeforme, A. braziliense (rare outside coastal areas of North Queensland, Northern Territory and northern Western Australia), Uncinaria stenocephala) and TAPEWORMS (Dipylidium caninum, Taenia taeniaeformis). 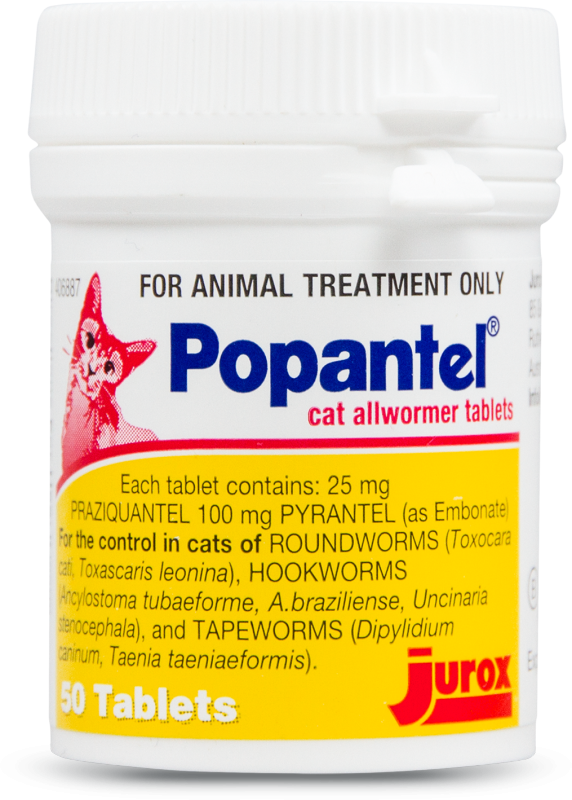 Popantel Cat Allwormer Tablets provide gentle and effective control of worms. They may be given to all cats including old animals, young kittens, pregnant queens and show animals. These tablets are not suitable for use in dogs. It is essential to weigh cats before treatment. Give as a single dose by mouth. Cats should be dosed on an empty stomach. Worms, if present, may not appear in the droppings after treatment, or may not appear for up to 48 hours after treatment. Worms often re-infest cats, so it is necessary to treat the cat itself, reduce environmental contamination by daily disposal of droppings where possible, and control intermediate hosts, e.g. fleas, rats and mice. Kittens: Treat at 6, 8 and 12 weeks, then 3 monthly. Pregnant and lactating queens: Treat prior to mating, 10 days before kittening, and 2 and 4 weeks after kittening. These recommendations are of a general nature. In specific instances where infestation is particularly heavy or many cats are housed together, a veterinary surgeon should be consulted. Flea tapeworms can re-infect cats and begin producing segments 2 to 3 weeks after treatment. If segments appear before the next Allwormer treatment is due, either retreat with Popantel Cat Allwormer Tablets or use Popantel Tapeworm Tablets as an intermediate, tapeworm only, treatment. If worm problems persist, consult a veterinary surgeon. Note: Segments seen in the droppings less than 2 weeks after treatment will probably be from the zipper worm (Spirometra erinacei), which is another tapeworm. When tapeworm treatment only is required, as in this case, use Popantel Tapeworm Tablets for Dogs and Cats. Popantel Cat Allwormer Tablets may be combined with other treatments, e.g. flea or tick treatment.